In 2014 the Yavapai Humane Society (YHS) had already assembled a high functioning Board of Directors. The seven member team had catapulted the organization into national prominence by effectively ending the use of euthanasia (killing) of dogs and cats as a means for controlling pet overpopulation in a region comprised of rural and urban communities. Our stats were impressive — making us the safest community in the US for dogs and cats. The combination of success and growth was the impetus for the Board to reach out to Charas Consulting for guidance in adding two new members to the Board of Directors. The Board needed to grow but did not want to risk degrading its effectiveness by inadvertently selecting candidates who could or would not add value to the Board’s vision, direction and accomplishments. There were five highly qualified candidates. Dr. Charas’ assessment was applied to the team of seven Board Directors and the five candidates. The assessment measured perceptions of current and ideal behaviors; and found, not surprisingly, a tight alignment of current and ideal board member characteristics and values. The survey of the five applicants identified potential misalignment in two candidates and strong reinforcing alignment in three candidates. With Dr. Charas guidance we saw that we were a powerful Board of individuals who, because of our trust in each other, could play with the synergy we created by our openness to the whole. This confidence, supported by our understanding of Charas’ assessment, emboldened us to enroll the three aligned candidates rather than comfortably restricting ourselves to the insecure decision to take on no more than two candidates. Our confidence in ourselves as a Board and our relationship with our Executive Director and management team soared to new levels. We shifted from aspiration to inspiration – we were no longer subject to exogenous growth but had become captains of our own endogenous development. Not only did we notice this shift in ourselves, but organizations from coast to coast recently began to contact YHS to ask for help replicating our life-saving programs in their communities; even organizations in Israel asked for help. With Dr. Charas’ assistance we were seeing a new “way of being” emerge that started to attract new and more effective Board members and employees. One Foundation substantially increased a grant beyond what we asked stating they wanted to be seen partnering with and supporting YHS because we were a model for generously sharing expertise. Concurrent with the above success, YHS received both Charity Navigator and Guidestar’s highest rating for transparency and fiscal responsibility, increased revenue over 30%, significantly expanded its mission to include equines, launched a capital campaign; and enrolled local municipalities into transparent contract negotiations for animal control services in a manner that transformed our relationship from service provider to partners. In summary, YHS has shifted its focus from doing great things locally to being inspired by a Noble Cause – elevating our mission from a regional response to a local need to generously and profoundly impacting the cultures of other organizations and communities through sharing not only what we know, but who we are. The context in which we now function has changed radically in just six months thanks to the empowering conversation, commitment and coaching of Dr. Charas. This past Friday, July 10 at the Prescott Resort, the Yavapai Humane Society (YHS) was recognized by the Prescott Valley Chamber of Commerce at their 2015 Community Excellence Awards ceremony. YHS was honored as “The Organization of the Year.” Among the many YHS accomplishments cited by the Chamber, the impact of our no-kill ethic was particularly singled out. The Yavapai Humane Society (YHS) celebrated its 43rd Anniversary in March, however, it was only five years ago this month that YHS first embraced its no-kill ethic. The no-kill ethic refers to our commitment to apply the same criteria when deciding an animal’s fate that a caring pet owner or compassionate veterinarian would apply to a beloved pet. That is, healthy and treatable animals are not killed simply because of a lack of resources. Believe it or not, that was happening just five years ago. Killing animals because of a lack of resources may be the quick, convenient and, at least from afar, the easy thing to do. But I have never, in over 30 years in this field, heard anyone argue it is the right thing to do. 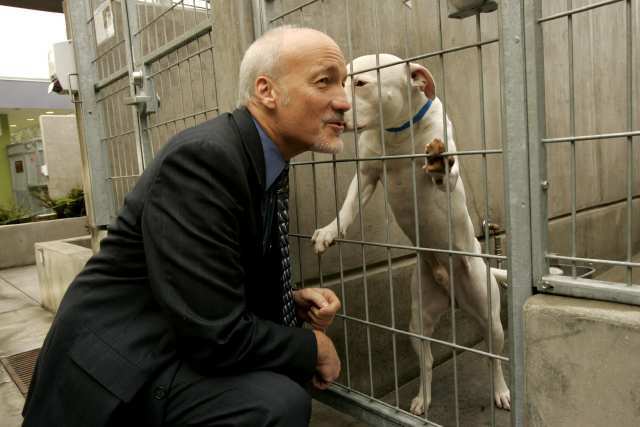 After all, the creatures who fill our shelters can hardly be faulted for bringing trouble upon themselves. People who excuse euthanasia in shelters often say we have to be “realistic.” But we contend such realism is best directed at the sources of the problem and at the element of human responsibility. It is gratifying to be recognized by the Prescott Valley Chamber of Commerce for the remarkable transformation the no-kill ethic has had on our community. In fact, YHS’ no-kill ethic is gaining attention in communities coast to coast. Organizations in Los Angeles, Mohave County, New York City and even the country of Israel have asked YHS for help embracing our no-kill ethic. YHS is fast becoming a world class organization. This growth has required every member of the YHS team to expand their individual capacity, vision and expertise. Working for YHS is no longer just a job; it’s not even just a career – it’s a vocation. I’m proud of every member of our team for getting us to where we are today; but even more exciting is where we’re taking YHS in the years ahead. If you are not a part of this life affirming effort, I invite you to join the YHS volunteer team. Other reasons cited by the Prescott Valley Chamber for selecting YHS as “The Organization of the Year” include our many lifesaving programs that ensure appropriate care is provided for every lost, homeless, sick and abused animal we rescue until we find them their forever home. YHS successfully “re-homes” 97 percent of the pets who come through our doors (compared to the national shelter average of about 40 percent). The 3 percent who are humanely euthanized are due to irremediable suffering resulting from disease or injury, or aggression that threatens public safety. The Chamber also called attention to YHS humane response to the significant increase in the number of animals rescued from hoarding situations (over 70 animals in the past 12 months compared to 20-30 animals in previous years); the recent expansion of the YHS New Hope program, which enables YHS to rescue animals from kill lists in shelters across the Southwest – effectively exporting the no-kill ethic; and YHS plans to include homeless equines in its rescue mission as early as 2016. It is gratifying to be recognized as our community’s “Organization of 2015” for providing a broad and compassionate safety-net for animals in greatest need. This award is deeply appreciated by the Board of Directors, employees and volunteers of YHS.